I'm finally able to show you my New Year's Eve nails, which also displays the last of my latest Born Pretty Store haul! 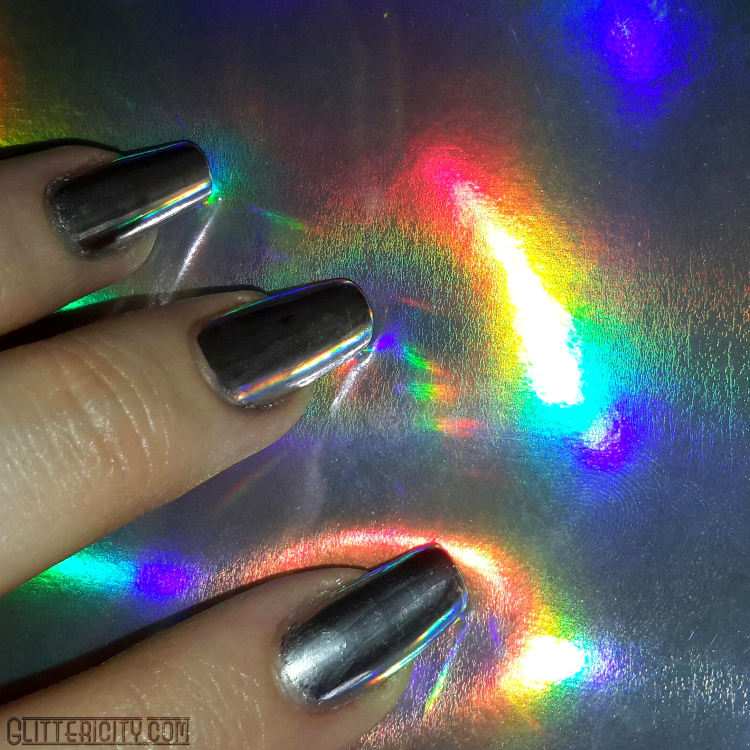 I played around extensively with this Mirror Finish polish set, and I think I found the best way to wear it. So, I've been looking for something like this for a long time. 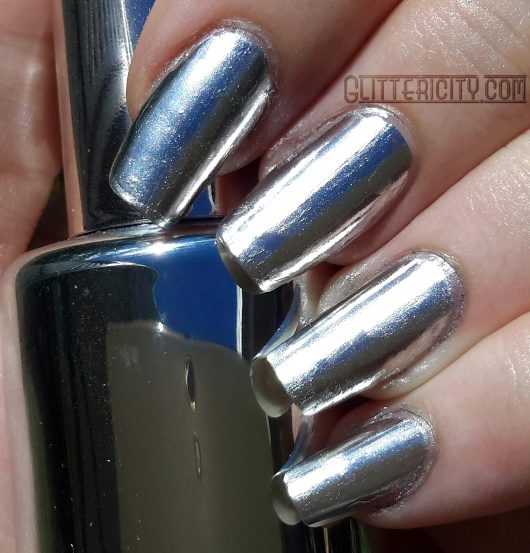 I've bought a lot of polishes that promise a "chrome" finish, and although they are all very pretty, they didn't give me that pure, blinding metallic shine I was after. I wanted it to look like fancy polished motorbike trim on my fingertips. This has finally sated my desire! It's very tricky to work with, but the results are SO worth it. This comes as a two-polish set: a clear base/top coat which I believe is a water-based one similar to Picture Polish's Revolution, or any other topcoat designed for foils, and the mirror finish paint itself. The clear coat was a bit disappointing to me. It took forever to dry, and did not self-level at all. I have very curved nails, and I found it pooling up on the sides where it had run down a bit and then ended up thicker on the sides and sparse in the middle. 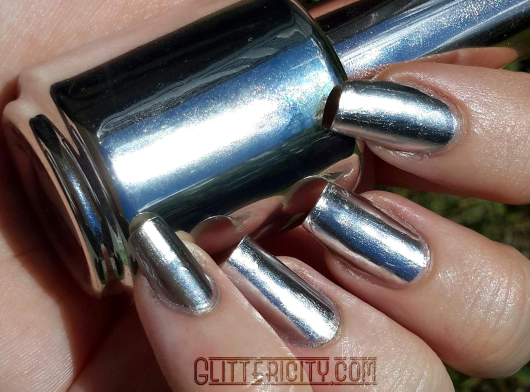 With any sort of metallic polish, you need a very smooth base to paint it onto, because it shows absolutely any and every little bump and imperfection. Therefore, painting it onto this base always looked a little lumpy and uneven. It also is disappointing as a topcoat--that being said, I tried five different topcoats, and none preserved the brilliant metallic beauty of this paint. In the end, I found you have to skip that for the last layer--more on that in a moment. I experimented with two other base coats, and found the aforementioned Picture Polish Revolution to be better as a base for this. 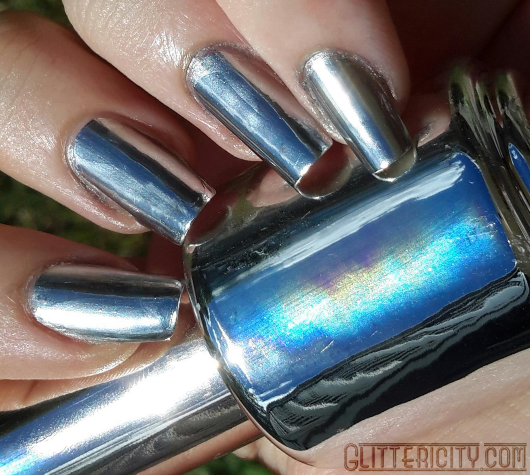 Nfu-Oh's Aqua Base (for holographic polishes) also worked well. Once a nice smooth base is dry, you're ready to apply the mirror finish paint. It is very thin and dries pretty much immediately, so you want to paint quickly but accurately. 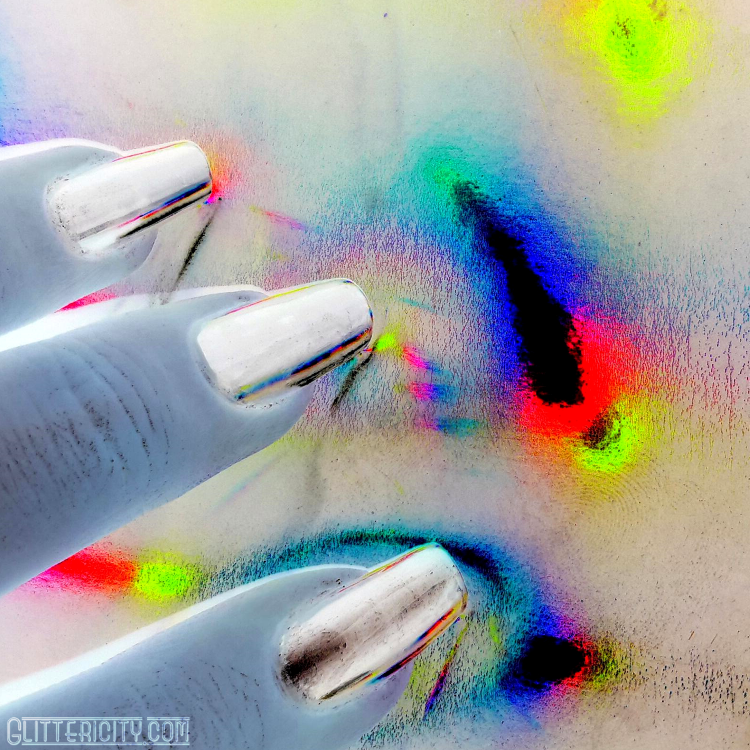 It's easy to flood your cuticles with this stuff, and I found it hard to clean up afterwards, because 1) acetone severely dulls the shine as soon as it touches this, and 2) it dries almost like a thin liquid latex, stretchy and tending to peel off in one sheet, so it tries to do this when you're performing any edge cleanup. I found the best technique is to work one nail at a time, and if you get it in your cuticles, immediately use a toothpick or orange stick to gently scrape it off and into a nice shape before it dries too much. That top layer lasts a little better than I expected, but it still will start to peel or wear off relatively quickly. If you have that sealed-in layer underneath, it is less noticeable when the top starts to wear off. Also, because the polish is so thin and dries so quickly, I actually just took it with me in my bag and touched them up halfway through the night. It's literally as easy as just swiping another coat over it. By the time I had the lid screwed back on the bottle, they were dry, and I could get on with the party. It didn't necessarily even need a refresh, but I wanted it to be as shiny as possible. I am SO happy with this, especially now that I've worked out how to keep that amazing shine going for at least a night out. It isn't long-wearing in the slightest, but if you're okay with touching it up here and there, you can wear it for at least a few days. And for a fun night out? It's PERFECT. I remember seeing those Minx mirrored nail wraps and wanting them, but this gives the same effect! It's so amazing with this holographic silver shiny bag, hey? :D Just for fun, I decided to try inverting the colours of the photo... check it out! For only $10, this is an absolute steal. Get it now! 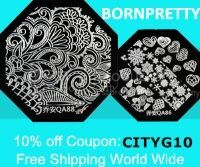 Shipping is free anywhere in the world, and if you use my discount code--CITYG10--at checkout, you can get 10% off the order. 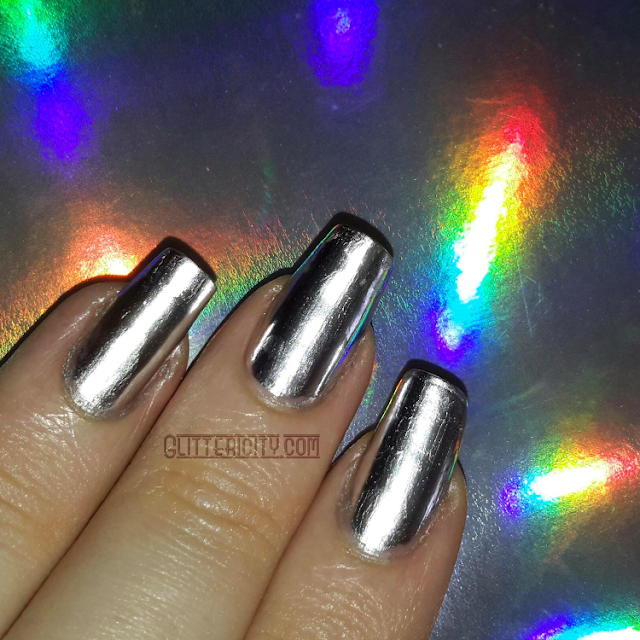 So actually, you can get heaps of mirrored manis for only $9!